APSWREIS V/5th Class Admission Test 2018, APGPCET 5th Class entrance test 2018/ AP #FIFCAT 2018 #APSWREIS #5th Class Entrance Test(#FIFCAT) 2018 Notification/ AP Social Welfare Entrance Test 2018: Andhra Pradesh Social Welfare Residential Educational Institutions Society(APSWREIS) Secretary V. Ramulu has given the AP FIFCAT 2018 Notification that means 5th class common entrance test 2018 notification on 10th March, 2018 and APSWREI Society invites the online applications from eligible students for admission into all Districts APSW Residential schools for 2018-2019. apswreis V 5th class admissions test 2018, ap fifcat 2018,online application form, results, hall tickets, last date, exam date, how to apply, ap social welfare entrance test 2018 details given here. The APSWREIS is intended to conduct an Entrance Test 2018 for admission into Class V during the academic year 2018-2019 in all APSWR Institutions across the state may be on 08-04-2018 between 11.00 AM to 12.30 PM. FOR THE ACADEMIC YEAR 2018-2019"
APGPCET 5th Class entrance test 2018 / AP FIFCAT 2018/ Sanghika Samkshema Patashalala Common Entrance Test 2018/AP Fifth Class Common Admission Test 2018/AP Social Welfare Schools Common Entrance Test 2018: APGPCET Admission Test for fifth Class in APSWREIS, APTWREIS and MJPAPBCWREIS Residential Schools, AP MJPBCWREIS Admission Test 2018, AP Fifth Class Entrance Test 2018, #APGPCET 2018, AP Gurukul CET, AP Gurukulams 5th Class Common Entrance Test 2018, AP Residential Schools 5th class Common Entrance Test 2018 for SC, ST, BC Students, AP Residential Schools Admission Test for 5th class admissions in SC, ST, BC Gurukuls, APGPCET 5th class Common Entrance Test for APSWREIS, APTWREIS, APBCWREIS Residential Schools. The APSWREIS visualizes to providing quality modern education to the talented students of belonging to marginalized section of Society, predominantly from rural through the use of modern techniques, pedagogy and various experiential learning activities in a stress-free environment to make learning a joyful experience. 1) SC / ST students should have born between 01.09.2007 to 31.08.2009. 2) OC / BC / SC-Converted Christians (BC-C) should have born between 01.09.2005 to 31.08.2009. 3) The student should have studied continuously in the respective district for the two academic years in a Government school or in a school recognized by the Government. 4) During this year candidates must be studying 4th class continuously in a Government school or in a recognized school. 6) The candidates can apply to any APSWR School of the district for which he / she belongs. 1. 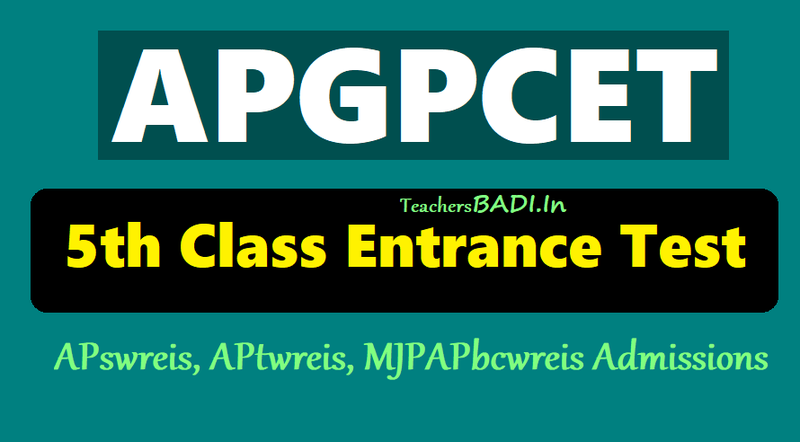 APGPCET / FIFCAT for maximum marks of 100. 2. Admission test will be held in English, Mathematics and Environmental Science based on State Syllabus of 4th class syllabus by A.P. State Government. 3. The questions will be of objective type and will be in English Medium only. 4. Test will be conducted in the opted centers of the district mentioned below. Available seats will have to be filled up as per the reservation pattern given below. 1. SC-75%, ST-6%, Scheduled Castes converted to Christianity (BC-C)-12%, B.C.-5% and others 2%. 2. Spl.Category: 15% of the seats are allocated, the children from the families who are withdrawn from Bonded labour, Orphans,Children of Jogins / Basavins, Victims of atrocities, shall be given seats as per the Standing order of the Society. 3. Upto 3% seats are earmarked for orphans / destitute in the age appropriate to the class in Residential Schools as per G.O.Ms.No.47, dated 31.08.2010. 4. 3% of seats are reserved for disabled children. 2. Admission will be given as per merit obtained in Entrance Test APGPCET /FIFCAT-2018 and the preference of institution given by the student in online application.